The Comité Alfred Sisley will include this painting in the new edition of the Alfred Sisley catalogue raisonné by François Daulte, currently being prepared at Galerie Brame et Lorenceau. 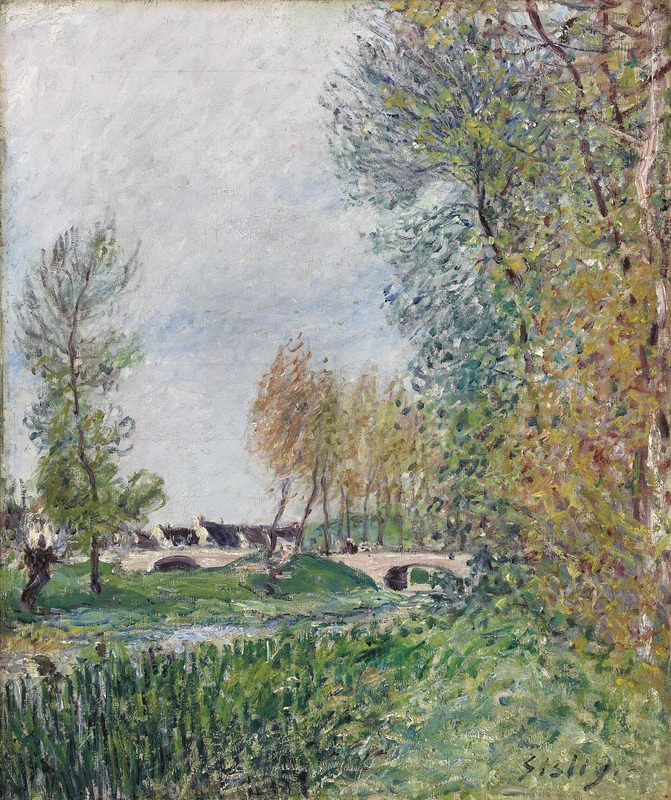 The move to the countryside marked a turning point in Sisley`s artistic career. Probably due to relief from financial hardship, his paintings of the 1880s display a renewed vitality and freshness. The area also provided him with a new variety of subjects: from Moret`s Gothic church and medieval stone bridge, the banks of the river Loing, the canal which follows its course, to the Seine near Saint-Mammès. Sisley often depicted his motifs from many different angles, sometimes creating sequences of several canvases. In the present painting, Sisley has set up his easel on the riverbank of the Orvanne, a small tributary of the Loing near Moret, between the reeds lining the creek and a row of tall poplars. The trees lead the eye towards a multi-arched stone bridge and roofs of houses in the distance. The skies are friendly, but slightly overcast, causing pink and silvery reflections on the foliage, rendered in short, rhythmic brushwork. Sisley himself pointed out that that he usually sang or hummed while working outside, and that he found the trio of the scherzo in Beethoven`s septet especially motivating.